In those heady early days of the Internet, email was an amazing innovation. Think of it: a communications medium nearly as fast as a telephone call, but one that left a permanent record that could be retrieved or reprinted at need. Great idea! Indeed, the idea was so powerful it helped push the fax machine out of many business offices. Over the years, email has been hardy enough to withstand competition from upstarts such as instant messaging and texting. Much of the credit for this durability goes to business, which needs the broader stage that email provides to deliver more details than can be crammed into a text stream. That is why we are going to take a look at how your business can optimize its use of email communications. Every company has this tool at hand, but not everyone is using it to the best advantage. Not all email messages are equally important. Today, we’ll be looking at official communications from your small business, law firm, or medical practice. What you write to your friends—even if you are using your official work email address—isn’t relevant to our discussion; go wild, if you like. Likewise, if you are writing messages to single clients and customers you have known for a very long time, go ahead and personalize the message as appropriate. If done tastefully, that will reinforce the bonds of familiarity between you. News announcements for your business. For example, a new colleague has joined your office, allowing you to expand office hours or offer new services; you want to endorse an upcoming charitable event your company is co-sponsoring; you want to express thanks to local leaders for a special service to the community; or you want to offer appropriate greetings for an upcoming holiday. Newsletters. Many small businesses offer email-based newsletters sharing company events and digests of recent website articles. Email newsletters are much more affordable than print newsletters and can effectively maintain contact with loyal customers. Email campaigns. These consist of a series of emails sent periodically to prospective clients who have already shown an interest in your services—perhaps by ordering a promotional book or free offer. Effective email campaigns capitalize on existing interest and alert your audience to the full range of your services. Those three classes of email are vital engines for your profitability. You can’t afford to give them anything less than your full attention. Without a doubt, the questions I get about email most often ask about the special rules of grammar and punctuation that apply to this unique mode of communication. People seem to instinctually recognize that the flexible rules of grammar need to flex a little bit more with email. To which I reply: balderdash. The rules of grammar and punctuation are more-or-less fixed for professional writing. They get tossed overboard for very informal conversations—we mean you, text messages—but for business-to-customer emails, standard rules of grammar still apply. You will use the same rules in your email that you would for a website blog entry or a friendly letter to your customers. Wipe that sweat off your brow. We’ve just identified a huge category of things you don’t have to worry about. But there’s more to effective writing than getting verbs to agree with nouns and fixing spelling mistakes. What DOES matter for email is usage—word choice—and your overall approach. To help you along, we present eight specific recommendations. We don’t want you to sound stuffy or pompous. Your email, like your website, should aim for an informal writing level. You want something warm, friendly, and conversational in tone—definitely cozier than a normal business letter. Explain any unfamiliar terms in context, but the focus of an email message should not usually be educational; save that for the website. At the same time, you need to write to accommodate your readership’s limitations. Most people are not eager readers, but they resent being patronized. Your vocabulary has to adapt to your audience’s comprehension. An email about school sports injuries written for a general audience will need to be much more restrictive than one on estate planning directed to college professors. Just as a call to action is a key component of every article written for your website, each email should inspire the reader to do something. In most cases, you will entice readers to engage with your website, your primary marketing tool. In some cases, you may urge readers to contact your office or to patronize a favored charity. Business writing is intended to provoke action; if you do not tell your readers the response you want to see, why are you bothering to send out this message at all? A good email focuses on one big idea. Even email newsletters follow this rule by presenting multiple stories as current company news. If you have multiple points to make, then send out multiple emails—probably to different recipients—a powerful function fully integrated into DSS. Let’s not write a novel here, okay? Some people who receive your message will be getting dozens of emails every day. A short message implicitly tells the reader you recognize his time is limited and valuable. Some business management experts suggest a hard limit of five sentences in every email, even going so far as to say that fewer than five sentences produces a message that appears abrupt. I do not think any fixed limit is reasonable. Instead, bear in mind that you can always direct a reader to the article on your website where you have noted exceptions, clarified ambiguities, and provided the depth of detail that can’t fit in a simple email. 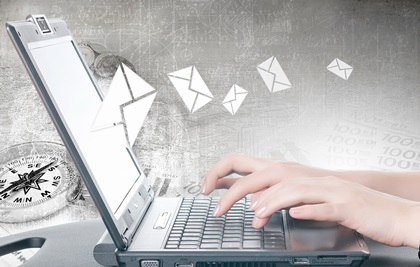 A brief, one-topic message with a clear call to action is the ideal business email. No Internet chat abbreviations. I have a friend who seems unable to write an email without three or more LOLs. Never have I laughed out loud. No leetspeak or other nonstandard spellings. If you fail to communicate as an adult, what you say will not be taken seriously. No swearing. Look, we have talked about this before. Swearing in a professional document makes you look like the 13-year-old who decides to demonstrate his maturity by trying out profanity in front of the whole family at Grandma’s birthday party. And some fraction of your readership will be offended by even the mildest cursing. You don’t want potential clients to have extra reasons to reject you, so avoid vulgarities. What good is a well-crafted email if nobody opens it? You have one way to make sure your potential reader engages with your message instead of sending it directly to trash email: the subject line. Never send out an email with an empty subject line. Instead, use the space to write a brief, engaging preview of the contents of your message. For the best results, limit the subject line to about 50 characters, including spaces. When your email is finally composed, don’t hit SEND—not just yet. Have someone else review it first. Proofreading is an essential part of the writing process for all professional content—emails just as much as webpages. Proofreading will catch routine errors, and the odds say that at least once a year it will also identify a potentially embarrassing mistake that would require a follow-up message or two to correct. By itself, email does not drive sales. Rather, it may position your firm more favorably in the reader’s mind and convince him to take other action—such as visiting your website—that will convert the reader into a customer. Converting shoppers to customers is, after all, our big selling point here at Foster Web Marketing. We know lots of ways to help get that job done. Need some ideas? Need a helping hand? Call our team at 888-886-0939 to find out what we can do for you today.